To guide policy and control measures, decent scientific data are needed for a comprehensive assessment of epidemiological, clinical and virological characteristics of the First Few hundred (FF100) cases. We discuss the feasibility of the FF100 approach during the 2009 pandemic and the added value compared with alternative data sources available. The pandemic preparedness plan enabled us to perform a case–control study, assessing patient characteristics and risk factors for experiencing symptomatic influenza A(H1N1)2009 infection and providing insight into transmission. We assessed to what extent timely and novel data were generated compared to other available data sources. In May-December 2009, a total of 68 cases and 48 controls were included in the study. Underlying non-respiratory diseases were significantly more common among cases compared to controls, while a protective effect was found for frequent hand washing. Seroconversion was found for 7/30 controls (23%), and persisting high titers for 4/30 controls (13%). The labour-intensive study design resulted in slow and restricted recruitment. The findings of our case–control study gave new insights in transmission risks and possible interventions for improved control. Nevertheless, the FF100 approach lacked timeliness and power due to limited recruitment. For future pandemics we suggest pooling data from several countries, to enable collecting sufficient data in a relatively short period. The worldwide increase in the incidence of influenza caused by avian influenza viruses since 1997, both in poultry and humans, introduced the potential for another influenza pandemic and the need for pandemic preparedness plans[1–4]. Comprehensive assessment of the First Few Hundred (FF100) cases to timely characterise clinical, virological and epidemiological features and for risk factor information is an important part of these plans. Despite the continuing threat of avian influenza viruses, the first official influenza pandemic in the 21st century was caused by the so-called influenza A(H1N1) 2009 virus. In the Netherlands, as elsewhere, initial rapid assessments of the impact of this new influenza virus on the human population have been based on case-studies of the first notified laboratory confirmed cases[5, 6]. These studies provided vital information to guide management, but more standardised and detailed information was still needed to guide control activities, to underpin policy decisions and for communication with the general public and the media. The Dutch pandemic preparedness plan included a generic study protocol and questionnaires to rapidly collect detailed key epidemiological, clinical, virological and immunological data of a limited number (approximately one hundred) of the earliest patients and their close contacts. The design of this FF100 cases and contacts approach enabled a case–control study aiming at identifying patient characteristics and risk factors for experiencing a symptomatic influenza A(H1N1) 2009 infection in the general Dutch population, and made it possible to get the insight into the transmission of the influenza virus. This is in contrast to other studies and FF100 approaches, which focused on cases only and were therefore dependant on ecological analysis for risk factor analysis. * The diagnostic nose- and throat swab on which the patients were included in the study was taken by the physician of the municipal health service and is not entered in the schedule. ^ For hospitalised cases the first visits, until the moment of discharge, were scheduled in hospital. # The GP took a finger prick instead of a venipuncture. This report summarises the findings from the case–control study with respect to risk factors for symptomatic infection and transmission. Moreover, the FF100 cases and contacts approach is discussed in terms of the feasibility during the 2009 pandemic and the added scientific value compared with alternative data sources available. We will go into the difficulties of performing this approach real time and the lessons learned. A comprehensive generic study protocol for detailed data collection was written following the 2003 outbreak of influenza A(H7N7) among poultry in the Netherlands[7, 8], and approved beforehand by the Medical Ethical Review Committee of the University Medical Center Utrecht in 2007. In May 2009, the protocol was adapted to the situation of the pandemic threat at that time and again approved by the same Medical Ethical Review Committee. The study started in June 2009, and was performed by the Centre for Infectious Disease Control (CIb) of the National Institute for Public Health and the Environment (RIVM), in collaboration with Public Health Services (PHS), a network of academic medical centres and the network of general practitioners (GPs) from the Continuous Morbidity Registration Sentinel General Practice Network of the Netherlands institute for health services research (NIVEL). Initially, laboratory-confirmed cases as well as controls were recruited via the PHS using the national mandatory notification system. Since the 15th of August, the notification criteria were limited from all possible, probable and laboratory-confirmed cases to hospitalised or deceased laboratory-confirmed cases. Therefore, the recruitment of study participants was continued in collaboration with GPs from the Continuous Morbidity Registration Sentinel General Practice Network of the NIVEL. The selection and inclusion of cases is described in more detail by Friesema et al. Contacts were defined as persons who had close contact with the case in the early stage of infection, and who had no symptoms of ILI at the time of inclusion in the study. They were approached for participation in the study at the moment patients were informed about the study. These contacts were considered as controls matched for exposure to influenza A(H1N1) 2009 virus. Controls developing symptoms of ILI during the period of follow up were maintained as controls according to the study design. After consenting, both cases and controls were visited by a research nurse at day 0 (within 8 days from the onset of disease). During this first visit the study objectives were further clarified, the case and control information was handed over, and written informed consent was obtained from both the case and control(s). As shown in Table1, data collection was carried out at days 0, 5, 10 and 30. From the 15th of August onwards, the first GP consultation was counted as the day 0-visit for cases and the first home visit for controls was scheduled at day 5. For cases as well as controls, the number and type of samples taken before and after the 15th of August were the same, with the exception of an extra blood sample (finger prick) for cases taken at the GP visit. The same schedule was also applied for hospitalised cases and their controls. During hospitalisation, the study was carried out in the hospital by the attending physician. After discharge, the remaining home visits were taken over by a research nurse. Both cases and controls were asked to complete a detailed questionnaire. This questionnaire included questions about demographics, medical history, use of medication, exposure to influenza A(H1N1) 2009 virus, symptoms of the current episode, and hygiene aspects. Real-time RT-PCR for detection of pandemic influenza A(H1N1) 2009 virus in combined nose and throat swabs and serology was done as described previously[10, 11]. Seroconversion was defined as a change in titre from no hemagglutination inhibition to a titre ≥1:40, or as having a four-fold or greater rise in titres between two successive samples. Multivariate logistic regression analysis was used to examine whether patient characteristics and/or potential risk factors were associated with a laboratory-confirmed symptomatic infection. The dependent variable was symptomatic disease (i.e. being a case or control). Variables with a P-value ≤ 0.10 in the univariate model were included in the multivariate model. Backward selection was used to identify covariates that were independently associated with symptomatic disease. Significant odds ratios (ORs) were presented with 95% confidence intervals (95% CI). Insight in transmission was obtained by studying the serology results for controls. These analyses were restricted to controls of whom at least two blood samples were available. Persisting high titers (≥ 1/40) in the first and following blood samples were considered as a proxy for exposure to the same source as the case, while seroconversion was considered as a proxy for secondary transmission whereby the case acts as probable source for the control. With respect to the feasibility of our study design during the 2009 pandemic, we assessed the number and timing of inclusion of patients willing to participate in the study versus the total number of notified influenza A(H1N1) 2009 virus infections in relation to the timing of notifications. 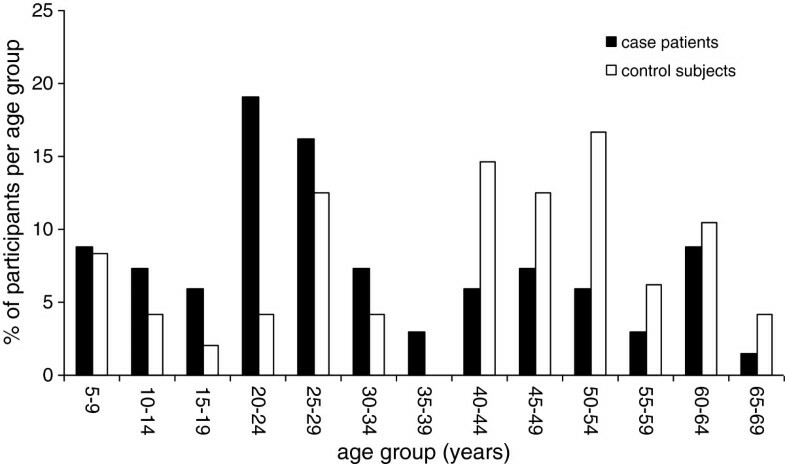 Furthermore the age distribution of included patients was compared with that of the notified patients. The added value of the used approach was explored by comparing the findings of the case–control study with alternative data sources. Statistical analyses were performed using SAS version 9.2 (SAS Institute). Between June and December 2009 a total of 76 of 120 invited patients were willing to participate in the study (63%). Written informed consent and a completed questionnaire were received for 68 of these cases, as well as for 48 controls. The response rate for controls could not be assessed, since no information about the number of approached controls was available. Next to the questionnaire, at least one combined nose and throat swab was available for all cases and at least one blood sample for 32 cases (47%). For the controls these numbers were 34 (71%) and 33 (69%), respectively. The age distribution of cases and controls is shown in Figure 1. Age distribution of cases and controls of the case–control study during the influenza A(H1N1) 2009 pandemic in the Netherlands, 2009. The median age of cases (26 years, range: 5–67 years) was significantly lower than that of controls (45 years, range: 7–67 years). Underlying lung disorders, including asthma, COPD, and cystic fibrosis, were reported by 28% of the cases and 25% of the controls (p = 0.7). Underlying non-respiratory diseases, including various disorders like cardiovascular disorders, immunological disorders and diabetes mellitus, were reported by 18% of the cases and 5% of the controls (p = 0.04). Cases and controls were compared with respect to reported medical history, smoking, antiviral treatment, seasonal influenza vaccination status, and current hygiene aspects to assess which variables were independently associated with symptomatic disease. Multivariate logistic regression analyses, adjusted for age and gender, showed that underlying non-respiratory diseases (including cardiovascular disorders, immunological disorders and diabetes mellitus) were significantly more common among cases compared to controls (OR = 9.7; 95%CI: 1.6-57.9). Next to this, a protective effect of frequent (≥8 times a day) hand washing was found (OR = 0.37; 95%CI: 0.15-0.90). Seroconversion was found for seven of the 30 controls (23%), of whom at least two blood samples (minimal 8 days apart) were available. For three of these seven controls the PCR of the combined nose and throat swab, taken at the inclusion in the study, was positive. Persisting high titers in the first and following blood samples were found for four of the 30 controls (13%). For one of them the PCR, taken at the inclusion in the study, was positive. For a total of 19 controls (63%) no serological response was found. Inclusion of the required number of cases and contacts during the period of influenza activity in the Netherlands lagged behind the notified cases reported to the national mandatory notification system. By the time the first hundred patients were notified, 2 cases were recruited, and by the time 200 patients were notified, 14 cases were recruited. Figure 2 shows the number of included patients willing to participate in relation to the number of notified patients. Number of notified patients and number of cases willing to participate in the case–control study during the influenza A(H1N1) 2009 pandemic in the Netherlands, 2009. About 50% of the cases were included via the PHS before the 15th of August. The remaining 50% was included via the GPs from the NIVEL network. Three of the participating cases were admitted to hospital, of which two were included through the participating academic medical centres. The inclusion of hospitalised cases could only start a median of 153 days after the approval of the baseline protocol, because it was necessary to obtain approval of the study protocol by the Medical Ethical Review Committees of the individual academic centres. All age groups were represented in the case–control study (Figure 1), and the age distribution of the included cases corresponds to that of the first 115 laboratory-confirmed cases in the Netherlands. The control/case ratio in the case–control study was 0.7 (48/68), indicating we included less than one control per case. The inclusion of children as control was in particular difficult, as indicated by the significantly higher median age of controls compared to cases. The Dutch FF100 case–control was unique in including controls alongside cases and observed an increased risk of symptomatic infection among those with non-respiratory underlying conditions, while frequent hand washing was found to be protective. In addition, serological results indicated that nearly a quarter of exposed contacts had evidence of secondary transmission rate. However, the labour-intensive design was logistically extremely challenging during times of intense work pressure, resulting in slow and limited recruitment, and results might have been biased by the low number of included cases and controls. Despite intensive preparedness planning the added value of the comprehensive assessment of the FF100 cases and contacts during the 2009 influenza pandemic in the Netherlands was less than expected due to limited number of participants underlying the novel observations and the delay in recruitment of both cases and controls. The results of our study suggest an increased risk for symptomatic infection in patients with underlying non-respiratory diseases. This is in contrast with several other studies observing that established risk factors for complications of seasonal influenza were also associated with severe illness from influenza A(H1N1) 2009 infection[6, 12–20]. However, these studies differ to our study in both the study design and outcomes, making valid comparisons practically impossible. Most of these studies were case-based studies without a control group. Besides, they mainly focussed on risk factors for severe outcomes of influenza, while we studied risk factors for symptomatic infection. Frequent hand washing appeared to have a protective effect on symptomatic infection. Assuming that daily hand washing frequency is a proxy of the hand hygiene in general, this finding suggests that hand hygiene may reduce the transmission of pandemic influenza virus. This is in agreement with recent studies suggesting that hand hygiene prevents transmission of influenza A(H1N1) 2009 virus in households and crowded communities[21–24]. However, heightened attention to hygienic behaviour for controls facing a diseased relative or friend may have caused recall bias in the present study. The results of these analyses could have been influenced by differences in the severity of disease between extramural and hospitalised patients, but exclusion of hospitalised patients led to similar results. Based on serological responses of the controls included in our study, the secondary transmission rate was over 20%. This is in line with Cowling et al., reporting a fourfold or greater rise in antibody titer in about one fifth of the household contacts, although no distinction was made between pandemic and seasonal influenza virus in that study. The persistently high titers found in four controls in our study, might indicate that they had been exposed to the same source as their case. For at least one control this assumption is supported by a positive PCR at inclusion in the study, although a cross reactive response can not be excluded. The addition of the FF100 cases and contact approach to the comprehensive assessment of the Dutch pandemic preparedness plan was based on the experiences of the 2003 outbreak of influenza A(H7N7) among poultry in the Netherlands[7, 8]. Rapid and structured collection of detailed epidemiological, clinical, virological and immunological data appeared to be essential for the management of control activities and for communication. The inclusion of both cases with relatively mild symptomatic infection and of close contacts is a strength of the FF100 cases and contacts approach. Most studies on influenza A(H1N1) 2009 virus so far concern case-series, mainly including severe cases and most studies on risk factors focused on a serious outcome of disease caused by influenza A(H1N1) 2009 infection[6, 12–16, 25, 26]. Moreover, the inclusion of contacts improved the insight in both risk factors for symptomatic infection in the general Dutch population and in the transmission of pandemic influenza A(H1N1) virus to close contacts. Nevertheless, the course of the 2009 pandemic and the resulting workload made it impossible to include the intended first few hundred cases and contacts in a limited period of time, which is a substantial limitation of our study. Since the influenza A(H1N1) 2009 virus had already spread internationally before it was recognised, the implementation of containment and mitigation measures was practically impossible, resulting in a rapid increase of the number of cases worldwide. Following the restriction of the mandatory notification in the Netherlands on the 15th of August 2009, only a relatively small number of cases and controls were available for inclusion in the study. Moreover, the public perception of the pandemic changed when it became clear that the majority of patients developed mild disease, and therefore patients were less willing to participate in the study. This is in line with findings in the FF100 cases project in the UK. McLean et al. also showed that initially almost all laboratory-confirmed cases were included in the ‘first few 100 project’ in the UK, but as the case numbers began to increase, the proportion of cases included also decreased. Nevertheless, the UK FF100 project did succeed to identify key clinical and epidemiological characteristics of infection with the pandemic influenza A(H1N1) virus in near real-time, although the lack of controls suggests that some caution is needed in the interpretation. The higher number of participants might partly be explained by the significant pandemic spring wave in England compared to the Netherlands, which provided many more opportunities for PHS’s to approach people. Also, the absence of the inclusion of controls would make approaching and consenting a more smooth process. We acknowledge there are some further limitations to our design. First, questionnaire data were used to report patient characteristics and to measure exposure to potential risk factors. This could be less reliable compared with observational data. Moreover, heightened attention to the cause of their complaints by cases may have caused recall bias. Secondly, we cannot rule out the possibility that controls were in the incubation period for infection, even though they had no respiratory complaints at the moment of inclusion. This, in combination with the limited sample size, might have diluted the investigated relations between symptomatic disease and patient characteristics as well as potential risk factors. Despite the slow and limited recruitment, the FF100 cases and contact approach is well-suited for rapid and detailed collection of epidemiological, clinical, virological and immunological data, and is a necessary addition to case based data. This is also shown by the FF100 cases project in the UK. The UK was one of the first European countries affected and experienced a substantial first wave in spring and summer 2009. Their FF100 cases project was rapidly established and captured information on almost 400 of the first UK cases in the first 7 weeks of the pandemic; 37% of all cases reported in that period. For future pandemics we therefore suggest that several countries share the same comprehensive baseline study protocol to rapidly collect detailed epidemiological, clinical, virological and immunological data of the first few hundred cases as well as their close contacts. This will facilitate the possibility pooling the data, and therefore increase the number of both cases and close contacts resulting in more timely data and more power to strengthen novel findings. Similar European projects are already initiated, like EURO-MOMO monitoring the excess mortality and ECDC I-MOVE monitoring the influenza vaccine effectiveness[29–32]. This will require revision and harmonisation of the pandemic preparedness plans, which has to be elaborated in the inter-pandemic period. The labour-intensive design of the FF100 cases and contact approach resulted in a limited recruitment. However the findings of our study were supplementary to those of case based studies and important to guide control activities, to underpin policy decisions, and for communication. Our study showed an increased risk for symptomatic infection in cases with underling non-respiratory disease, a protective effect of frequent hand washing and a secondary transmission rate of about 20%. To increase timeliness and power during future pandemics we suggest pooling the key epidemiological, clinical, virological and immunological data for both the first few hundred cases and their close contacts of several countries, to make it possible to collect the required data in a relatively short time period. Collaborative pooling of the data from several countries may significantly increase the scientific and public health utility of the FF100 approach. This study was financially supported by the Ministry of Health, Welfare and Sport (the Netherlands) and by The Netherlands Organisation for Health Research and Development Funding (ZonMw). L van Asten (RIVM, Bilthoven, the Netherlands), D Baas (RIVM, Bilthoven, the Netherlands), D Beaujean (RIVM, Bilthoven, the Netherlands), J van Beek (RIVM, Bilthoven, the Netherlands), R van Binnendijk (RIVM, Bilthoven, the Netherlands), C Boucher (Erasmus Medical Center, Rotterdam, the Netherlands), M van Boven (RIVM, Bilthoven, the Netherlands), JC Braspenning (Radboud University Nijmegen Medical Centre, Nijmegen, the Netherlands), M Bults (Radboud University Nijmegen Medical Centre, Nijmegen, the Netherlands), R Coutinho (RIVM, Bilthoven, the Netherlands), F Dijkstra (RIVM, Bilthoven, the Netherlands), J van Dissel (Leiden University Medical Center, Leiden, the Netherlands), T Donker (RIVM, Bilthoven, the Netherlands), GA Donker (NIVEL, the Netherlands), R Fouchier (Erasmus Medical Center, Rotterdam, the Netherlands), P de Fraaij (Erasmus Medical Center, Rotterdam, the Netherlands), IHM Friesema (RVIM, Bilthoven, the Netherlands), AB van Gageldonk-Lafeber (RIVM, Bilthoven, the Netherlands), R Grol (Radboud University Nijmegen Medical Centre, Nijmegen, the Netherlands), F Heijningen (RIVM, Bilthoven, the Netherlands), W van der Hoek (RIVM, Bilthoven, the Netherlands), A van den Hoek (Public Health Service of Amsterdam and LOI, Amsterdam, the Netherlands), M Hooiveld (NIVEL, Utrecht, the Netherlands), M Hulscher (Radboud University Nijmegen Medical Centre, Nijmegen, the Netherlands), J IJzermans (NIVEL, Utrecht, the Netherlands), L Isken (RIVM, Bilthoven, the Netherlands), M de Jong (Academical Medical Centre – University Amsterdam, the Netherlands), A. Kroneman (RIVM, Bilthoven, the Netherlands), Can Kesmir (Utrecht University Medical Center, Utrecht, the Netherlands), F van der Klis (RIVM, Bilthoven, the Netherlands), T van 't Klooster (RIVM, Bilthoven, the Netherlands, M Koopmans (RIVM, Bilthoven, the Netherlands), M Kretzschmar (RIVM, Bilthoven, the Netherlands), IM van der Lubben (RIVM, Bilthoven, the Netherlands), M Mak (RIVM, Bilthoven, the Netherlands), J van der Meer (Radboud University Nijmegen Medical Centre, Nijmegen, the Netherlands), A Meijer (RIVM, Bilthoven, the Netherlands), JJ van Oosterheert (Utrecht University Medical Center, Utrecht, the Netherlands), A Osterhaus (Erasmus Medical Center, Rotterdam, the Netherlands), J Prins (Academical Medical Centre – University Amsterdam, the Netherlands), J Reimerink (RIVM, Bilthoven, the Netherlands), R Riesmeijer (RIVM, Bilthoven, the Netherlands), G Rimmelzwaan (Erasmus Medical Center, Rotterdam, the Netherlands), MAB van der Sande (RIVM, Bilthoven, the Netherlands), F Schellevis (NIVEL, Utrecht, the Netherlands), M Schutten (Erasmus Medical Center, Rotterdam, the Netherlands), J van Steenbergen (RIVM, Bilthoven, the Netherlands), A Steens (RIVM, Bilthoven, the Netherlands), MAJB Tacken (Radboud University Nijmegen Medical Centre, Nijmegen, the Netherlands), P Teunis (RIVM, Bilthoven, the Netherlands), A Timen (RIVM, Bilthoven, the Netherlands), M van der Velden (iResearch, Berg en Dal, the Netherlands), R Verheij (NIVEL, Utrecht, the Netherlands), L Vinck (RIVM, Bilthoven, the Netherlands), J Wallinga (RIVM, Bilthoven, the Netherlands), A Westerhof (RIVM, Bilthoven, the Netherlands), L Wielders (RIVM, Bilthoven, the Netherlands), CC van den Wijngaard (RIVM, Bilthoven, the Netherlands), O de Zwart (Rotterdam-Rijnmond Public Health Service, Rotterdam, the Netherlands). We thank all municipal health services, hospitals and laboratories in the Netherlands as well as all participating GPs, their patients, Marianne Heshusius-Valen (NIVEL, Utrecht, the Netherlands), and SALTRO, Primary Health Care Laboratory (Utrecht) for their cooperation in the data collection. We also would like to thank Guus Rimmelzwaan (Department of Virology, Erasmus Medical Center, Rotterdam, the Netherlands) for performing the serological assays and the technicians of the Diagnostic Laboratory for Infectious Diseases and Perinatal Screening of the National Institute of Public Health and the Environment for performing the virological diagnostic tests. AvG participated in the design and coordination of the study, performed the statistical analyses and had the lead in drafting the manuscript. MvdS participated in the design and coordination of the study, in performing the statistical analyses and drafting the manuscript. AM participated in the design and coordination of the study, drafting the manuscript and was responsible for the virological and serological assays. IF participated in the design and coordination of the study, in performing the statistical analyses and drafting the manuscript. GD participated in the coordination of the study as project leader of the network of general practices. JR participated in the coordination of the study, and was responsible for the serological assays. MR participated in the design of the study. JP participated in the design and coordination of the study with respect to the academic centers. LI participated in the design and coordination of the study. FS participated in drafting the manuscript and headed the network of general practices. MvdL participated in the design and coordination of the study, and in drafting the manuscript, and was responsible for the virological assays. All authors read and approved the final manuscript.